Sometimes Anselm is depicted as having single-handedly introduced an illegitimate perspective into Christianity (at the portentous and suspiciously precise date of the turn of the second millennium). This is inaccurate. Anselm’s insights are anticipated by Ambrose, Hilary of Poitiers, and Victorinus, among others… (not to mention Isa. 53:4-6; Rom. 5:12-21; 8:3-4; II Cor 5:21; Gal. 3:10-14; I Pet. 2:24; 3:18; etc.). Indeed… Let’s not mention all these scripture passages! I love that she includes an “etc.” after seven references. Anselm. Therefore none but God is able to make this satisfaction. Anselm. But none but a man ought to do this [he has already established that it is the guilty party, and no one else, who ought to make the restitution]. Boso. Nothing could be more just. Anselm. If it be necessary, therefore… that [salvation] cannot be effected unless the aforesaid satisfaction be made, which none but God can make and none but man ought to make, it is necessary for the God-man to make it. Boso. Now blessed be God! We have made a great discovery. Rutledge has already argued in the chapter that when Anselm uses the word “satisfaction” he means “atonement” or “rectification”—God’s way of putting things right. 1. 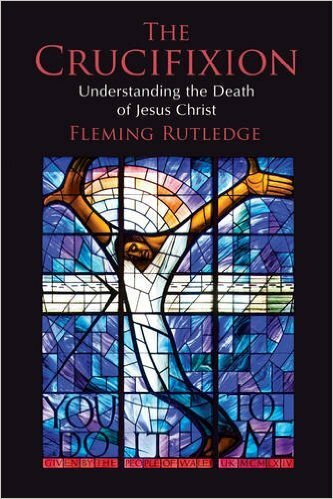 Fleming Rutledge, The Crucifixion: Understanding the Death of Jesus Christ (Grand Rapids: Eerdmans, 2015), 146. This entry was posted on	July 15, 2016 at 1:07 pm	and is filed under Uncategorized. Thank you for reminding us that penal substitution has always been and must always be part of our faith. Q 12: According to God’s righteous judgment we deserve punishment…how then can we escape this punishment and return to God’s favor? A: …the claims of his justice must be paid in full, either by ourselves or by another. Q13: Can we make this payment ourselves? Q14: Can another creature…pay this debt for us? Q15: What kind of mediator and deliverer should we look for then? A: One who is true and righteous human, yet more powerful than all creatures, that is, one who is also true God. Q16: Why must the mediator be a true and righteous human? A: God’s justice demands that human nature, which has sinned must pay for sin; but a sinful human could never pay for others. Q17: Why must the mediator also be true God? A: So that the mediator, by the power of his divinity, might bear the weight of God’s wrath in his humanity and earn for us and restore to us righteousness and life. Q 18: Then who is this mediator–true God and at the same time a true and righteous human? A: Our Lord Jesus Christ, who was given to us to completely deliver us and make us right with God. A: Because God’s justice and truth require it: nothing else could pay for our sins except the death of the Son of God. The Heidelberg was my lesson in what all I did not know and understand about basic orthodox Christianity. I was stunned at how much more info the rank and file Christians of the 1600’s were given compared to the random drivel I had learned across my lifetime. A very modern book about the Heidelberg, “Body & Soul” by M. Craig Barnes, left me wishing somebody had taught me these things sooner. I hear you! I bought a book on the Heidelberg Confession a few months ago. I haven’t read it yet. But I will!